Kas was one of the most important cities of Lycia, and is now a small resort with great historical interest. 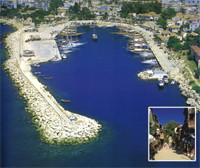 Its quaint town centre has a rocky waterfront, with good beaches nearby. There are watersports available in the area, like canoeing, jet-skiing, diving and paragliding, plus cavern diving, which uses technical equipment to explore the deep and dark caverns. For those who love travelling on the water, the Mavi Yolculuk (Blue Voyage) tours, and other excursions on boats, can be made to the surrounding islands.